Join us the night of Patriots’ Day to hear from renowned storyteller and Northeastern University historian, Bill Fowler discuss two important figures who shaped the fabric of the American Revolution and the country that it formed. Dr. William Morgan Fowler, Jr. is a professor emeritus of history at Northeastern University, Boston and a prolific author. 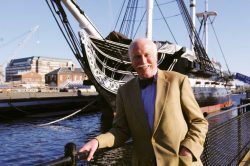 He served as Director of the Massachusetts Historical Society from 1998 through 2005. Along with numerous published works, Fowler wrote biographies on both John Hancock and Sam Adams The Baron of Beacon Hill: A Biography of John Hancock (1980) and Samuel Adams: Radical Puritan (1997). Members $5; Non-members $10. This program is supported in part by the Sally Lanagan Fund and grants from the Concord Cultural Council, the Lexington Council for the Arts, and the Lincoln Cultural Council – local agencies which are supported by the Massachusetts Cultural Council, a state agency.